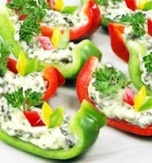 We propose you a bright vegetable appetizer which can be served with meat or fish course. 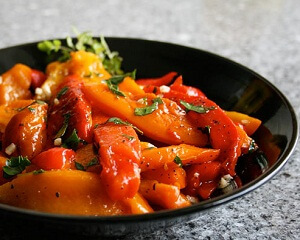 You can eat the baked and marinated bell peppers with bryndza or crispy toasts. 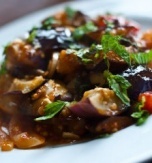 The advantage of this dish is that you can keep it in a fridge for a long time. Wash peppers and dry them. Place the peppers on a baking sheet covered with foil. Sprinkle them with olive oil and roast at 250°C (482°F) for 20 minutes. Turn over the peppers during the baking process one time in order to cook them evenly. Transfer the cooked peppers in a polythene bag. Set aside for 10-15 minutes. Rub off the pepper skins, remove the seeds and stems, next cut the vegetables into quarters. Pour the juice emerged during the cooking process in a bowl. Let’s cook a marinade. Peel and squeeze garlic. Wash basil, then dry and chop it. Add the garlic and basil to the bowl with juice and toss gently to combine. Then pour balsamic vinegar, lemon juice, fresh ground pepper and olive oil. Mix everything and season the marinade with salt. Tip! You can add more lemon juice instead of balsamic vinegar. It is better to combine all the ingredients gradually. 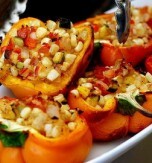 Place the prepared peppers in a deep bowl or jar and pour each layer of the vegetables with marinade. The peppers should be completely covered with the marinade. Place cling wrap above the bowl or cover the jar with a lid and place the peppers in a fridge for at least 3 hours (it is better to refrigerate the dish for a whole night – in that case the peppers will get a special flavor). 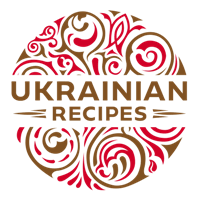 Do you have a favorite Ukrainian recipe for roasted bell peppers with garlic and olive oil? If so, please let us know in the comments below or write us an e-mail.